Above is another graphic that shows how local real estate is. 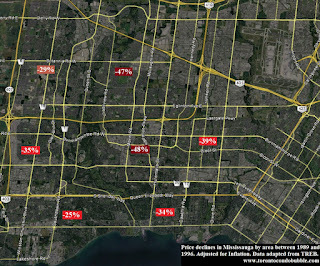 While the trend of the declining prices between 1989 and 1996 was the same throughout the Greater Toronto Area, the magnitude of how far prices dropped depended on exact location. Interestingly, just like downtown Toronto, Square One in Mississauga also crashed by almost 50% during the last bubble. 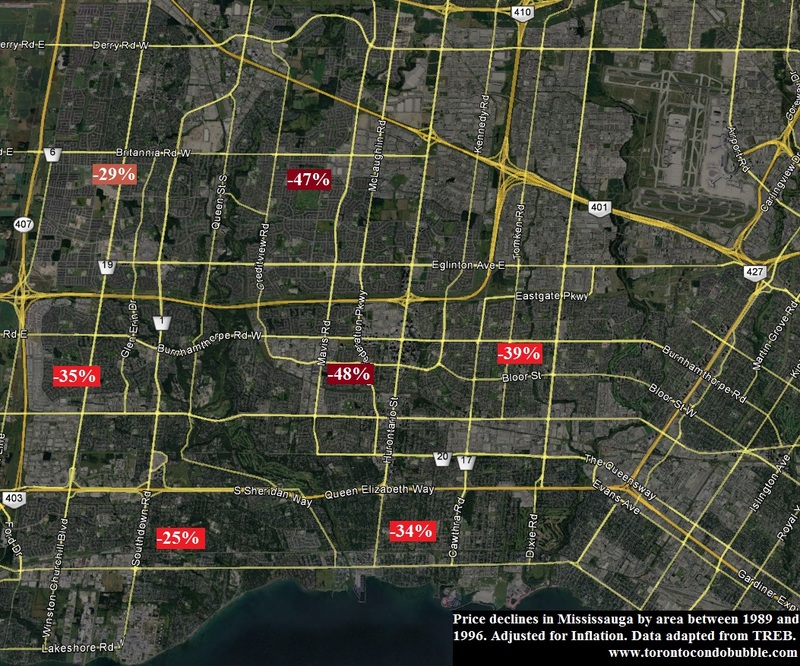 City of Toronto price declines between 1989 and 1996 are here. Below is the list of the other local bubbles in the GTA during 1980s. Price declines between 1989 and 1996 are presented for selected cities. Stats are adjusted for inflation. Note, I am not 100% sure whether the TREB areas were exactly the same between 1989 and 1996, thus some errors are possible. If anything, the above stats should provide a decent idea of price declines between 1989 and 1996. The stats are adjusted for inflation using the Bank of Canada inflation calculator.